How much luggage can I bring on a cruise? Can I bring shampoo? What about food? Will my bags be searched? If you’re a first-time cruiser, you might have a number of question about what you can — and can’t — pack for a cruise. The good news? The rules surrounding cruise luggage are far simpler and more straightforward than what you’ll find on a flight. In fact, you can think of the rules surrounding your luggage as more similar to traveling to a hotel instead of traveling on a flight. Still, if you’re taking a cruise, chances are you’re going to pack a little more than a toothbrush. So you no doubt have a few questions about luggage and baggage on the ship. Unlike airlines, cruises don’t charge for the amount of luggage you bring. There are also no (reasonable) limit on how much you can bring. Most cruise lines “encourage” each passenger to limit luggage to two suitcases, each one less than 50 pounds. In addition, you can also bring carry-on luggage (more on that in a moment). While there are no strict restrictions on your checked baggage, you should keep a few common sense items in mind. 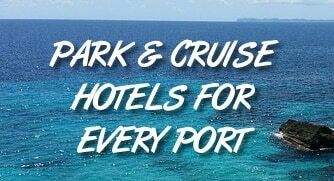 First, keep in mind that you have to get all your luggage to and from the cruise ship. If you are flying, that may mean extra fees for extra bags. And even if you are driving to the cruise terminal, you still have to carry (or arrange for someone else to carry) all that luggage. We encourage people to pack reasonably. There is no harm in wearing the same thing twice during a cruise — many others will be doing just that. As well, every ship has laundry service if you need it. If you are taking more than one piece of luggage and one carry-on, then you are likely overpacking. Of course. You can’t bring weapons such as guns or long knives on board. If it’s even questionable (such as pepper spray), it’s best to just leave it at home. Scissors are also restricted. More importantly, except for lighters, you can’t bring anything dealing with fire. Fire is the biggest risk on board a ship. For that reason, irons are restricted, as are candles and incense. Flammable liquids are also prohibited. If you think it could start a fire, it’s best to leave it at home. Cruise lines also have restrictions on alcohol that you can bring on board. Most will let you bring some sort of wine or champagne, but only in small quantities. Beer or hard liquor are almost never allowed. Click here to read more about bringing alcohol on a cruise. Can I bring a curling iron, hair straightener or a hair dryer? While clothes irons aren’t allowed, you can bring things like a straightener, hair dryer or curling iron. You should definitely be careful, and not forget to unplug them when not in use (in fact, room stewards may do so if they see it left unattended when servicing your room). As for hair dryers, you can bring one from home but cruise cabins have these built in, similar to a hotel. They are small, but can get the job done for a few days of vacation. Does the “3-1-1” liquids rule apply to cruises? The “3-1-1” rule is ubiquitous in airports. It’s the rule that you can only bring liquids three ounces or less in a one quart plastic bag, with one bag per passenger. For everyone’s sanity, this rule does not apply to cruise ships. Bring shampoo from home or a bottle of hairspray or a full-sized tube of toothpaste. Just keep in mind that if you have to fly to the port, then you’ll still have to meet the guidelines on liquids for air travel. Can I bring alcohol in my bags when boarding? If you want to bring beer or liquor, then the bad news is that these aren’t allowed in cruise ships. If they are found, they will be removed and discarded. The good news? cruise lines do allow you to bring a bottle or two of wine or champagne. The amount varies among cruise lines, but it’s usually one bottle (750 mL) per adult in a cabin. When you bring this on, just keep it in your carry-on luggage. You don’t want to put it in checked luggage where it can possibly be broken. What about rules for carry-on luggage? When you arrive at the port, you will check your large luggage (unless you want to carry it on). This luggage will be carted off, X-rayed, put aboard the ship, and then delivered to your room. But that entire process will take several hours. For that reason, passengers are encouraged to bring some sort of carry-on that has anything you might need for the first few hours on the cruise ship — travel documents, passports, medications, allowed alcohol, toothbrush, your swimsuit, and maybe even a change of clothes for dinner. Can you pack all your luggage for the cruise in your carry-on? Absolutely. There is no rule that you have to check luggage. However, keep in mind that you will have to lug your carry-on items around the ship until your room is ready. If you check in early, that could be a couple of hours. Even a small bag can be a nuisance after that long. There are some “official” restrictions on carry-on sizes, but we’ve found them to be less strict than with an airline and rarely enforced. As long as you can safely and easily move your bag, it should be ok to board with. Will my bags be searched on a cruise ship? All baggage brought on board the ship will be X-rayed. When you go through security you will set your bags on the x-ray machine like you’d find at an airport. Checked luggage is also X-rayed behind the scenes. Usually further inspection isn’t required unless the security staff finds something dangerous or prohibited. Where do I put my suitcase in the cabin after I unpack? There’s no arguing that cruise cabins are small and you might be wondering where to put an empty suitcase so that you aren’t constantly tripping over it. Fortunately cruise cabins do a great job of maximizing space. There are closets in every cabin that can hold a suitcase or two. You can also store them under the cabin bed so that you don’t have to worry about it taking up valuable space. Now that you know about the luggage and baggage rules, see our list of 39 useful things to pack for your cruise. Yep, you can put it in your checked luggage. Smoking is allowed only on certain parts of the ship… but it is allowed. Surprised you had to take it out at all — even in a carry-on. Edit: I see you had to take it out when you flew. Cruise security is more accommodating. If you don’t want to risk it, however, just toss it in the checked baggage. Are people allowed to bring their scale on a cruise? Like a bathroom scale? Sure, but keep in mind it might make you sad. There will also likely be scales in the gym if you don’t want to bring one. On a cruise? Nothing. The baggage rules are pretty lax. However, keep in mind that you will still need to carry it around on your way to the ship, so the lighter, the better! Yes, although hair dryers are already provided in cabins. Can I have my splash, perfumes, lotion and accessories on my carry in bag?? Is the carry-on allowed along with a purse? In other words, they don’t count a woman’s purse to be the carry on? Carry-on is simply what you bring on with you. You can bring every bag with you if you want to carry it. There are no real limits like there are on airlines. For instance, we always “carry on” a full-size suitcase and backpack. Where should I pack the water bottles I’m allowed to bring? They will be unopened and still sealed in their plastic. Also- should I put my cigarettes in my carry on or luggage? I am driving down so I won’t go through airport. It’s usually best to carry these items on with you if you can. That way they don’t have the potential to bust and soak other people’s bags. Will items be pulled out of carry on such as vapes and e liquid? Vaping and e-cigarettes are allowed on ships, but like regular smoking, it’s limited only to certain areas. So there’s no real reason for the security team to pull out the items. That said, they do have the right to inspect anything you’re bringing on the ship. This will be my first cruise, and I was wondering if you can check a duffle bag as luggage, or am I going to have to treat it as a carry on? You’re going to have a blast. On a cruise, you don’t have to “check” any luggage. You can if you want so that you don’t have to carry it, but you can also just carry it on yourself. It’s not like a plane where there is only a certain amount of room.